Abstract: Methods of critical social analysis can be understood as deliberative dialectical reasoning whose main argument type is practical argumentation, with explanation embedded. How then does dialectical argumentation fit into critical method overall? I address this issue in terms of the relationship between dialectical argumentation and other facets of dialectic identified within Hegelian-Marxist dialectics, questioning the assumption in argumentation studies that the two are not connected. In Fairclough & Fairclough (2012) I argued that critical discourse analysis (CDA) needs to incorporate analysis and evaluation of argumentation because political discourse – a focus for CDA – is primarily practical argumentation and deliberation. I also argued that critical social analysis more generally needs to do the same in order to go beyond just claiming that discourse may contingently have constructive effects on social reality, to showing how: discourses provide reasons for/against acting in certain ways, and they may have constructive effects in so far as practical arguments stand up to critical evaluation, and lead to decisions, which lead to action, which has transformative effects on reality. In Fairclough (2013), I also suggested that critical social analysis, including CDA, is itself (self-evidently) a form of discourse, and that it is centrally a form of practical argumentation. Thus (practical) argumentation and its analysis and evaluation are relevant in two ways to critical analysis of political discourse: as a primary feature of the discourse being analysed, and of the discourse – and method – of critical analysis. In this paper I offer an account of how practical argumentation connects to other components of the method of critical social science and CDA, how the components are integrated, in terms of relations between dialectical argumentation and other facets of dialectic identified within Hegelian-Marxist as well as classical dialectics. One other component of the method is explanation; another is an orientation to and aspiration to contribute to transformative action to change existing states of affairs in broadly emancipatory ways. If, as I propose, the methods of critical social science and CDA have a dialectical character, in what way are they dialectical, and how might the dialectical character of argumentation be articulated with other dialectics which are distinguished in critical social science? Bhaskar’s work on dialectic (1989, 1993) is especially useful here. In part this argument is addressed to argumentation theory and analysis, which we draw upon extensively in the book. “Dialectic” for argumentation analysts is a facet of argumentation alongside logic and rhetoric. Yet a significant tradition in critical social analysis aims to be dialectical in a wider and broadly Hegelian-Marxist sense. From this point of view, dialectical argumentation is one form of dialectic amongst others, what Bhaskar calls “epistemological dialectic”; there are also ontological, practical and relational dialectics. What I am suggesting to argumentation analysts is that, in so far as they are concerned to apply their work in social analysis, they should perhaps consider how dialectical argumentation relates to these other dialectics. The argument is also addressed to critical policy analysts (Fairclough 2013): in so far as critique is conceived in a dialectical way, what is the place of dialectical argumentation within a critical conception of dialectic? My answer is that we can conceive critical method as dialectical reasoning: an epistemologically based, which means argumentatively based, constellation of epistemological, ontological, practical and relational dialectics – giving it an essentially argumentative character. My argument is of a theoretical nature, but I shall begin with a concrete example and introduce the main lines of my argument in a practical way. The Kilburn Manifesto is a critical social analysis written by a team whose core members – Stuart Hall, Doreen Massey, Michael Rustin – are critical scholars in various areas of social science, in which the question of “what is to be done”, of action to change existing neo-liberal social reality in emancipatory ways, is accentuated. It is a “manifesto by instalments” published in the journal Soundings (from number 53, 2013) and on the Manifesto website (www.lwbooks.co.uk/journals/soundingd/manifesto.html, see References for the instalments so far). I have space only for a sketch of my analysis of the Manifesto and my interpretation of it as a form of “dialectical reasoning” (see extracts and annotations in Appendix). The Manifesto has a layered and embedded character. The first layer is argumentation for changing the existing neoliberal state of affairs on the basis of critique and analysis of it, and certain values and goals. It is a form of practical reasoning and argumentation. The second layer represents how neoliberals have changed the prior social democratic state of affairs, including their arguments for doing so based upon their own critique and analysis, values and goals. The third layer suggests the same sort of thing for social democrats changing the prior state of affairs, but without detail and without representing their arguments. I suggest that the method of critical social science (and CDA) can be viewed as a form of dialectical reasoning, and that the Manifesto is an example. Dialectical reasoning has the four elements A-D. Its organising form is practical reasoning from Circumstance, Value, Goal and Means premises to a Claim for action, with explanation embedded within it. A-D include epistemological (A, C), ontological (D) and practical (D) elements. Both the first and second layers in the Manifesto include the elements A-D. I have presented extracts in Appendix 1 in a way which illustrates this, though the elements are presented as stages (1, 2a, 2b and 3) of dialectical reasoning as I suggest below. Bhaskar (1993) characterizes the essence of dialectic as “absenting constraints on the absenting of absences”. He argues that being includes absence, a necessary assumption in the move he is making from being to becoming (change). In his terms, the “real” includes an unactualized potential as well as what is “actual”. The actual is contradictory, and includes ideas (imaginaries) for states of affairs that could and maybe should but don’t presently exist, discourses which are different from those that presently exist, ‘goods’ which are different from the “ills” that actually exist etc. “Absences” subsumes all of these. Critique presupposes and is targeted at absences in this sense. Transformative action (praxis) to change the existing reality, including action for emancipatory change, seek to “absent absences” – eliminate parts of what exists, replace it, create new actualities. So procedures for working through flaws, contradictions, the coexistence of actual states of affairs and imaginaries for possible/desirable new states of affairs – all seen as absences – are the basis for transcending them, and achieving better modes of thought and forms of life. We can gloss Bhaskar’s formulation as: eliminating constraints on the correction or overcoming or elimination and replacement of absences. There are constraints on eliminating absences, and part of the business of dialectic is to eliminate such constraints. The Manifesto includes (element B, explanation) analysis of causal relations in which neoliberal discourse can be both effect and cause – cause of both existing states of affairs and associated “ills”; it advocates eliminating (“absenting”) neoliberal discourse and replacing it with different discourse. This is also a move in eliminating constraints on the correction of absences: it can contribute to eliminating and replacing (“absenting”) existing states of affairs and “ills”, because the causal efficacy of discourses is a constraint on doing so. Dialectical reasoning is an epistemologically-based constellation of epistemological, ontological, practical and relational dialectics. It is epistemologically based because it is a form of (primarily practical) reasoning, realized in practical argumentation and deliberation. It diagnoses through critique, beginning with critique of discourse, “absences” in discourse, in states of affairs, and in terms of “ills”, as a basis for advocating action to eliminate (“absent”) such absences. It is we might say focused upon error and correcting error as a contribution to knowledge. But it also has embedded within it ontological dialectic, the correction of absences in states of affairs, and is directed towards practical dialectic, the elimination and replacement of “ills”; and it includes relational dialectic, the elimination and replacement of existing relations (including cause/effect relations) between discourse (and more broadly “ideas”) and material facets of existing reality. The Manifesto is not overtly presented in the form which I have suggested for dialectical reasoning (and will make more explicit in the next section), for good presentational and rhetorical reasons, but it is an example of dialectical reasoning which can be reconstructed in accordance with this form. Critical social analysis is directed towards transformative action to change existing social reality for the better, i.e. in broadly emancipatory ways. It does not itself constitute such action, it seeks to support it, it moves towards it. It is a critique of existing social reality, including discourse, through which it arrives at accounts of existing states of affairs which, together with particular values and goals, and claims about what actions might achieve those goals, provide reasons in support of particular advocated lines of action. In other words, it is a form of practical reasoning. However, this is incomplete. To reach reasoned conclusions about lines of action also requires explanation of existing states of affairs. So the form of reasoning is practical reasoning with explanation incorporated within it, and can be characterized in terms of four stages corresponding to elements A-D above. The second and third are labelled 2a and 2b because they both appertain to explanation. This accords with the basic character of critical method, as I see it: it links together critique, explanation and action. * Stage 1. Normative critique of discourse (including practical argumentation) in terms of truth, rightness, truthfulness (Habermas). * Stage 2a. Explanation of normatively flawed features of discourse in terms of features of existing social reality. * Stage 2b. Explanatory critique of aspects of existing social reality, focussed upon relation between discourse and other elements. * Stage 3. Advocacy of lines of transformative action to change existing reality “for the better” (in emancipatory ways). The main argumentative scheme is practical argumentation. Stages 1 and 2 appertain to the Circumstances premise, with explanation embedded in the practical argument at this stage. Stage 3 appertains to the Claim, with reasons for the advocated line of action being drawn from the Goal (and indirectly the Value) and Means premises as well as the Circumstances premise. In terms of genre, this is deliberation: critical social analysis is in dialogue with existing argumentation which it critically evaluates. There is a lot of common ground on Stage 1, the starting point of method. Aristotle’s method was to start from phainomena, and from endoxa – generally accepted beliefs and opinions, what people say, ordinary people or “the wise” (Nussbaum 1986/2001, Evans 1977). We might now say starting from current discourse. Similarly Marx’s method – Marx begins his critique of political economy from the language, the discourse, of the political economists, and shows its contradictions, thereby identifying problems which need to be resolved in systematic inquiry and analysis (Fairclough & Graham 2002). CDA also starts from, and critiques, current discourse, and there is also a wider tendency within critical social analysis to do so. Pragma-dialectics, one of the most influential current approaches to analysis and evaluation of argumentation, also proceeds from current discourse – existing arguments. Differences arise over what methods proceed to. Pragma-dialectics proceeds I think from discourse to discourse – from different “opinions” to shared “opinions”. But there is a different view of dialectic in Aristotle as proceeding to, seeking to attain, “a truth of some sort by inquiry” (Krabbe 2002), though the precise role of dialectic in the achievement of truth, its relationship to analytic in Aristotle, is a matter of debate (Smith 1997, p. xviii). And for Marx, as well as CDA and critical social analysis more generally, dialectic proceeds from discourse to, or towards, truth, in a practical sense: the right thing to do, the right action to take. In the version of dialectical reasoning I am proposing, dialectic proceeds from existing discourse and normative critique of existing discourse to advocacy of a line of action as the right action to take, on the basis of explanation of existing discourse in terms of existing social reality and explanatory critique of aspects of existing social reality. Explanation is an essential component of critique with emancipatory aims; we cannot get from critique of existing discourse, or of social reality more generally, to or towards emancipation, without explaining their normative flaws; without explanatory comprehension of existing reality, we have no basis for identifying, deciding upon and taking, action which may contingently transform existing social reality (Bhaskar 1989, 1993[i]). For instance, we can’t assess the likely consequences of action. This passage [from a text written by David Urquhart] shows, at one and the same time, the strength and the weakness of that kind of criticism which knows how to judge and condemn the present, but not how to comprehend it (Marx 1954, p. 474 footnote 1). Explanation is – usually implicitly – present in existing frameworks for evaluating argument (Fairclough & Fairclough 2012): in critical questioning of arguments in terms of sincerity as possible rationalizations, of truth and rightness, and of consequences of advocated action. So it’s not just a matter of bringing explanation in from outside, so to speak, it’s also a matter of drawing out what is already present. Embedding explanation in practical argumentation (deliberation) extends the object of critique from (normative) critique of discourse to (explanatory) critique of existing states of affairs (including relations between discourse and other elements). So CDA – and this is perhaps a general model for critical social analysis – starts from a critique of discourse, but its critical object is not just discourse but existing social reality, using discourse as a “point of entry” into this wider critique. In the case of rationalizations, Fairclough & Fairclough (2012) adopt Audi’s (2006) view that they fail to meet normative criteria for good argumentation and are open to critical evaluation on those grounds, which is compatible both with a pragma-dialectical view of a sincerity condition for speech acts and Habermas’s view of sincerity as a precondition for rational discourse. Rationalizations are cases where the reasons that are offered in support of a claim are not the reasons that support the claim from the viewpoint of the arguer. An example we discuss in the book (pp. 178 ff.) is Brian Griffiths’ – Vice-Chairman of Goldman Sachs International – arguments for paying high “compensation” and bonuses to bankers and tolerating the inequality entailed as a means for achieving the goal of prosperity and opportunity for all. One Guardian reader’s response to a report about this was that Griffiths’ “trickle-down” argument is a “scam for a bunch of … greedy incompetent lying bastards to justify their outrageous salaries”. This is normative critique – it’s a “scam”, a deception, in our terms a rationalization – but also a partly implicit explanation, which is twofold: the real cause of inflated “compensation” and inequality is greed; and the cause of the rationalization is the need to provide justification and to hide the real cause. This is the basis for explanatory critique that connects stage 2b to stage 3: the state of affairs which allows bankers etc to get away with such greed and such rationalization is a flaw in existing social reality which should be eliminated. Critical evaluation of the premises of arguments in terms of truth or falsity includes ideological critique, which is a form of explanatory critique: the claim that inflated “compensation” leads to prosperity and opportunity for all can be normatively criticized as untrue, but also explained as necessary to sustain the existing state of affairs, i.e. as ideological. It can be subjected to explanatory critique: a state of affairs which requires such untruths is a flaw which should be eliminated. Another way of critically questioning a practical argument is by showing that the action advocated in its Claim is likely to produce consequences which undermine important goals. But claims about what the likely consequences are need to be supported by explanations of what causes what in the existing social reality. I have already introduced Bhaskar’s view of the essence of dialectic as “absenting constraints on the absenting of absences” and his distinction between epistemological, ontological , practical and relational dialectics. Epistemological dialectic is concerned with eliminating (“absenting”) errors and so advancing knowledge through argumentation, ontological dialectic is changing (“absenting”) states of affairs, practical dialectic is eliminating/replacing (“absenting”) ‘ills’, relational dialectic is “absenting”/replacing existing relations between discourse and other aspects of reality. Bhaskar (1993, p. 3) also claims that “in its most general sense, dialectic has come to signify any … process of conceptual or social … conflict, interconnection and change, in which the generation, interpenetration and clash of oppositions, leading to their transcendence in a fuller or more adequate mode of thought or form of life … plays a key role”. Dialectical argumentation and deliberation is epistemological dialectic. Dialectic as dialogue, dialectical argument, is social interconnection and sometimes conflict in which different standpoints and arguments are opposed with an orientation to moving towards the truth and the right thing to do. This may be dialogue in the most basic and direct sense, face-to-face dialogue, or monologue which draws different standpoints and argument into indirect dialogue. The opposition or clash between standpoints and arguments involves a process of normative evaluation of all the standpoints/arguments at issue. One focus of evaluation is upon contradictions within arguments; the focus more generally is upon, in Bhaskar’s (1993) terms, “theory-practice” contradictions, contradictions between what is said and what is really the case. However, setting what is said against what really is the case requires, as I have indicated in discussing explanation, a shift to ontological analysis, analysis of states of affairs, which is the basis for explanatory evaluation of states of affairs, with a focus upon contradictions in them which involves relations between discourse and other elements of states of affairs. Ontological dialectic is “absenting” states of affairs, changing states of affairs to different states of affairs. 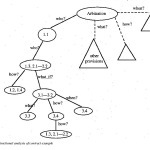 Our account of practical argumentation in Fairclough & Fairclough (2012) takes goals in the Goal premise to be imagined possible future states of affairs which the action advocated in the Claim is advocated as a possible means of achieving, to replace the existing state of affairs as represented in the Circumstantial premise. On this account, the epistemological dialectic is articulated with ontological dialectic: “absenting” erroneous arguments, including erroneous representations of states of affairs and erroneous representations of the consequences of action, in favour of better arguments and representations, is articulated with “absenting” flawed states affairs – eliminating them and replacing them with other states of affairs which exclude their flaws. However, epistemological and ontological dialectic are also articulated with practical dialectic, with anticipated transformative action to absent “ills” in the existing social reality, using “ills” as a cover term for aspects of it which we have good reasons – which of course have to be provided – to see as antithetical to human well-being, the “good society”, and so forth. And these three dialectics are articulated with relational dialectic, “absenting” existing relations between discourse and other aspects of reality, replacing them with new relations. Hence dialectical reasoning as I have construed it can be seen as an epistemologically-centred constellation of epistemological, ontological, practical and relational dialectics. It is epistemologically-centred in that what we are talking about, after all, is a form of reasoning and argumentation. It incorporates practical dialectic not in the sense that it actually is transformative action to eliminate “ills”, which it is not, but in the sense that it anticipates and seeks to serve and be articulated with it. It incorporates ontological analysis and dialectic not in the sense that it performs such analysis, which it does not, or in the sense that it changes states of affairs, which it does not, but in the sense that it necessarily presupposes and draws upon ontological analysis, and in anticipating transformative action to eliminate “ills” it also anticipates, seeks to serve and to be articulated with the “absenting” of existing states of affairs and the production of new states of affairs. Let me relate this to a particular area of critical social analysis. Policy studies has made an “argumentative turn” which recognizes the centrality of argumentation in policy debate and policy-making, and critical analysis of argumentation in critical policy analysis. Its concerns are not however limited to argumentation and argumentation analysis as such, but to how they connect with diagnosis of problems in existing states of affairs and the overcoming of these problems and the “ills” associated with them through changing states of affairs, eliminating and replacing (“absenting”) existing states of affairs. Addressing the constellation of epistemological, ontological, practical and relational dialectics through a focus on dialectical reasoning could therefore be a way of approaching its concerns. Practical, dialectical argumentation is both an important object of critical social analysis, and its method, in dialectical reasoning. Moreover, dialectical reasoning, through its deliberative character, incorporates the former into the latter. But dialectical argumentation is just one facet, an epistemological one, of change and truth arising from conflict and contradiction through “absenting”, eliminating and replacing. Other facets however – ontological, practical, relational – are brought into the scope of agency, action and change through dialectical argumentation; so dialectical reasoning is epistemologically-based. A genre is a form with a potential which is only partly actualized. The genre of deliberation can potentially take the form of dialectical reasoning, but it rarely does, the potential is only partly actualized. I suggest that an aim of critical social analysis, and of CDA in particular, is to realize, more fully actualize, this potential, both in its own method and in “members’ methods” – those of politicians, policy experts, citizens and so forth. For everyone with an interest in emancipatory change can gain by appreciating: how discourse (and ideas and beliefs), states or affairs, goods and ills are articulated together in existing reality; that emancipatory change requires “absenting”, eliminating and replacing, all three , and the relations that hold them together; that emancipatory change can result from critique only via the mediation of explanation. Dialectical reasoning binds these together in an operational way. “The aim of the manifesto is to focus attention on the nature of the neoliberal settlement, including the social, political and cultural battles that have attended its emergence and maintenance – and those that might help bring about its demise” (Editorial, Soundings 53 2013, p. 4). “The vocabulary we use, to talk about the economy in particular, has been crucial to the establishment of neoliberal hegemony … [for instance] the majority of us are primarily ‘consumers’, whose prime duty (and source of power and pleasure) is to make ‘choices’. The so-called truth underpinning this change of descriptions … is that, in the end, individual interests are the only reality that matters; that those interests are purely monetary; and that so-called values are only a means of pursuing selfish ends by other means. And behind this … is the idea of a world of independent agents whose choices, made for their own advantage, paradoxically benefit all. That the world is not like that is evident. There are monopolies and vastly differential powers. There is far more to life than individual self interest. Markets in practice need vast apparatuses of regulation, propping-up and policing … Moreover, this privileging of self interest, market relations and choice … leads inexorably to increased inequality … (which) is protected from political contest by another shift in our vocabulary … ‘liberty’ … defined simply as self interest and freedom from restraint by the state … has become so much the dominant term that the resultant inequalities have eviscerated democracy, and the vocabulary of equality has been obscured from view” (Massey 2013). So neoliberal discourse is normatively criticized because it is (a) a falsification of existing reality, (b) unjust – leads to “glaring inequality”. Contradictions of neo-liberal discourse: “This assumption of the naturalness of markets is crucial to the insistence that There Is No Alternative … one of the ghastly ironies (is) that we are told that much of our power and our pleasure, and our very self-identification, lies in our ability to choose (and we are indeed bombarded every day by ‘choices’, many of them meaningless …), while at the level that really matters – what kind of society we’d like to live in, what kind of future we’d like to build – we are told, implacably, that … there is no alternative – no choice at all” (Massey 2013). “The language we use is one of the sources of the political straightjacket we are in … this vocabulary of customer, consumer, choice, markets and self interest moulds both our conception of ourselves and our understanding of and relationship to the world. These ‘descriptions’ of roles, exchanges and relationships in terms of a presumption that individual choice and self interest does and should prevail are in fact not simply descriptions but a powerful means by which new subjectivities are constructed and enforced. … The new dominant ideology is inculcated through social practices, as well as through prevailing names and descriptions. The mandatory exercise of ‘free choice’ … of a hospital to which to be referred, of schools for one’s children … is … also a lesson in social identity, affirming on each occasion that one is above all a consumer, functioning in a market. By such means we are enrolled, such self-identification being just as strong as our material entanglement in debt, pensions, mortgages and the like. It is an internalisation of ‘the system’ that can potentially corrode our ability to imagine that things could be otherwise. This question of identity and identification, moreover, goes beyond our individual subjectivities. Everything begins to be imagined in this way. The very towns and cities we live in are branded in order to contend against each other, including internationally, in a world in which the only relationships are ones of competition. So, the vocabularies which have reclassified roles, identities and relationships … and the practices which enact them embody and enforce the ideology of neoliberalism, and thus a new capitalist hegemony. Another set of vocabularies provides the terms through which the system describes itself and its functions. These frame the categories – for example of production, consumption, land, labour, capital, wealth – through which the ‘economy’ (as a supposedly distinct and autonomous sphere of life) is understood. These definitions constitute another element of ‘common sense’ … As we pointed out in our framing statement … the gains made by labour under social democracy proved intolerable to capital and a backlash was launched. Even mere redistribution could only be allowed to go so far. And one crucial element … was the dislodging of the common sense which underpinned these aspects of the social democratic approach – in particular the commitment to … equality and the important role of the state and public intervention … in achieving this. Changing our economic language was crucial in shifting our world-view” (Massey 2013). “[T]he aim of the rise of neoliberalism was an active undermining of the economic and political gains made by ordinary people during the post-war social-democratic settlement. Its whole point was to engineer a class rebalancing. From this point of view it has succeeded. And the predictable crisis of its model has now become grist to its mill: it is being used as a pretext for further restructuring and redistribution” (Massey & Rustin 2014). Changing the vocabulary (discourse) > “dislodging” (+ replacing) “common sense” (“absenting it”); replacing identities; replacing social practices > the neoliberal backlash, a new capitalist hegemony (as a precondition for it, as “absenting” constraints on its “absenting” of absences in social democracy). A complex and not simply uni-directional set of causal relations (e.g. changes in common sense etc > changes in practices > changes in common sense) connect changes in: discourse, common sense/identities, practices, structures (“hegemony”). Explanations of causal relations slide over into critique of states of affairs (the existing social reality – not just the discourse) in which they obtain – e.g. the passage in italics above. Explanations are part of analysis and are factual claims; but some factual claims are simultaneously value claims. Bhaskar (1989, p. 101): if we have adequate grounds for supposing that belief X is false, and that S explains X, then “we may, and must, pass immediately to” a negative evaluation of S, and a positive evaluation of action directed at its removal (“absenting”). It follows from our argument that an economy should be a means for fulfilling social goals, and not an end in itself, and that a means of deliberating and determining what such goals should be is essential to democracy. But our political institutions do not currently serve this purpose. … Yet there are always cracks in the carapace. Hegemony has to be constructed and maintained and is thereby always open to challenge. And most of social reproduction in fact relies on non-financial relations, of trust, care and mutual responsibility. Not only is not absolutely everything captured, but those other feelings still resonate and resist” (Massey & Rustin 2014). i. “The subject matter of the human sciences includes both social objects and beliefs about those objects” [and] “relations” [between these aspects] “are both causal” [ontological, relations of generation] “and cognitive” [epistemological, relations of critique]. “Only a discourse in which the explanatory, as well as the critical, condition” [causal as well as cognitive] “is satisfied can be intrinsically emancipatory” (Bhaskar 1989, pp. 101-2). Audi, R. (2006). Practical reasoning and ethical decision. London: Routledge. Bhaskar, R. (1989). Reclaiming reality. London: Routledge. Evans, J. D. G. (1977). Aristotle’s concept of dialectic. Cambridge: Cambridge University Press. Fairclough, I., & Fairclough, N. (2012). Political discourse analysis. London: Routledge. Fairclough, N. (2010). Critical discourse analysis: the critical study of language. London: Longman. Fairclough, N. (2013). Critical discourse analysis and critical policy studies. Critical Policy Studies, 7(2), 177-197. Fairclough, N., & Graham, P. (2002). Marx as critical discourse analyst: the genesis of a critical method and its relevance to the critique of global capital. Estudios de Sociolinguistica, 3(1),185 – 229. Reprinted in Fairclough (2010, pp. 301-346). Hall, S., & O’Shea. A. (2013). Common-sense neoliberalism. Kilburn Manifesto, chapter 4. Soundings, 55, 8-24. Hall, S., Massey, D., & Rustin, M. (2013). After neoliberalism: analysing the present. Kilburn Manifesto chapter 1. Soundings, 53, 8-22. Krabbe, E. C. W. (2002). Meeting in the house of Callias: an historical perspective on rhetoric and dialectic. In F. H. van Eemeren & P. Houtlosser (Eds. ), Dialectic and rhetoric: the warp and woof of argumentation analysis. Dordrecht: Kluwer. Marx, K. (1954). Capital, volume 1. London: Lawrence & Wishart. Massey, D., & Rustin, M. (2014) Whose economy? Reframing the debate. Kilburn Manifesto, chapter 8. Rwetrieved from: www.lwbooks.co.uk/journals/soundingsd/manifesto.html. Massey, D. (2013). Vocabularies of the economy. Kilburn Manifesto, chapter 2. Soundings, 54, 9-22. Nussbaum, M. (2001). The fragility of goodness: luck and ethics in Greek tragedy and philosophy, revised edition. Cambridge: Cambridge University Press. Rustin, M. (2013). A relational society. Kilburn Manifesto, chapter 3. Soundings, 54, 23-36.